The artist known as François Brunery was christened Francesco Bruneri in the north Italian city of Turin at the heart of a region that is today part of both Italy and France. Although cultural and familial ties with France ran deep in the region, Turin was also the center of the mid-nineteenth century movement towards Italian unification; and in fact served briefly as the capitol of the new Italian nation from 1861-65. Within this cultural context, it is not unusual to find families whose lineage contains both French and Italian branches--and surnames that shift depending on the locale. François Brunery thus signs his paintings with both the French and the Italian versions of his last name. Brunery seems to have left Turin in the 1860s for Paris where he studied with two of the most prestigious academic painters of the day, Jean-Léon Gérôme (1824-1904) and Léon Bonnat (1833-1922). the older of these two mentors, Gérôme had established his reputation in the 1850s as a painter of classical themes, and then expanded his repertoire to include Orientalist themes. In addition his interest in anecdotal history painting, in which famous historical figures are shown going about about ordinary everyday activities, would serve as an example to Brunery in later years. Likewise, Léon Bonnat, one of Gérôme’s friends, was a well-established academic artist in 1860s Paris. Together, the two men left Paris in 1868 on an extended painting trip to the Middle East. It was after his return from Jerusalem and Egypt that Bonnat began to experiment with anecdotal genre paintings. Although his interest in this particular approach last only through the 1870s, it was prevalent during the years that the young Brunery was studying art in Paris. With his education completed, Brunery returned again to Italy. Although many of his paintings remain undated, there are a number of them that seem to have been created in the 1870s in Venice and the surrounding regions. Given his Italian citizenship, Brunery may well have decided to leave France during the disastrous Franco-Prussian War of 1870-71 when the country was torn apart by both a resounding defeat at the hands of the Prussians and by civil war during the Commune period of 1871. During these years, Brunery created many small format views of Venetian canals, piazzas and bridges, perhaps using the plein-air technique of painting on site. The emphasis on light and the use of stenographic brushwork suggests an influence of the very early work of the Impressionists as well. These typically small paintings were very appealing to the tourist trade, and no doubt provided Brunery with a respectable income from his art. He also mastered anecdotal genre painting during his time in Italy, beginning with the so-called “cavalier” painting tradition that had been popular in Venice since at least the 1700s. These scenes typically showed a dashing young man, dressed in the frock coat and silk stockings of the 18th century, either courting a young woman or admiring himself in a mirror. Such images were enduringly popular, and Brunery’s technical virtuosity showcased his considerable skill in creating a convincing light-hearted--and often slightly satirical--narrative. Brunery’s years in Italy served him well in terms of his career. When he made his Salon debut in 1879 with Le retard du fiancé (The Tardiness of Her Fiancé), he presented an appealing combination of social satire at the fiancé’s lack of enthusiasm for his upcoming nuptials and sensual delight in the beauty of fabrics, textures and decorative objects. [i] The following year at the Salon 1880, he turned his attention to portraiture with a work titled simply Portrait of Mme. 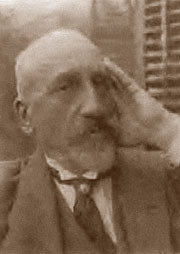 A. L... [ii] Throughout the rest of his career, Brunery exhibited regularly at the Salon, receiving an Honorable Mention for The Eavesdropper in 1903. As his career evolved, Brunery developed a particular specialty in what are now known as “Cardinal Paintings”. 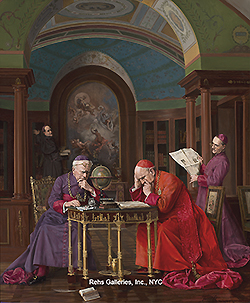 These images depicting cardinals of the Catholic church in comical or embarrassing situations, became increasingly popular in the late nineteenth century. 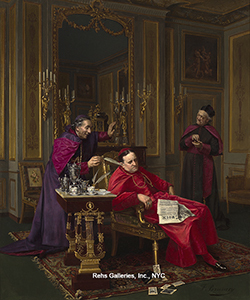 Artists such as Jehan-Georges Vibert, Georges Croegaert, Ferdinand Heilbuth and many others helped to create a sub-genre of anecdotal painting that took a tongue-in-cheek attitude towards the behavior of these presumably dignified and virtuous religious leaders. French anticlericalism was not new, but the level of satire and pointed irreverence intensified in the last half of the nineteenth century, partly in response to Pope Pius IX’s ongoing efforts to regain political power after enduring the skepticism of the Revolutionary and Napoleonic decades. When he proclaimed the doctrine of papal infallibility in 1869, he provoked even more suspicion of the church’s attempts to impose moral standards that it did not exemplify itself. It was an invitation to parody, most of which was relatively gentle, albeit unrelenting. Brunery’s contribution to the Cardinal Painting genre was substantial. Some of these works are good-humored illustrations of the all too human nature of prominent churchmen. A Wrong Note, for example, depicts a chamber ensemble of cardinals attempting to practice their music when the prideful soloist misses a note, much to the dismay of the rest of the group. Other images, such as A Delicate Balance, are less solicitous. In this painting, Brunery shows a plump cardinal attempting to cross a rickety wooden footbridge when he loses his footing and his stash of playing cards flies out of his sleeve. The lowly parish priest who has already successfully crossed the stream stares in disbelief as the evidence of the cardinal’s gambling--and perhaps cheating--becomes obvious. Similarly, the painting of The Cardinal’s Nephew implies that the young boy seated on the cardinal’s knee is not his nephew, but the son he fathered with the attractive young woman nearby. It is worth noting that this anticlerical satire found a welcome audience among people from all classes and was widely appreciated by academic and avant-garde artists alike. By the 1890s, Brunery established an international reputation as a painter of anecdotal genre scenes, and like many other artists, he began to explore the alluring American market for collectors. In 1891, a pair of paintings, Before the Ball and After the Ball, were included in an exhibition at the Powers’ Art Gallery in Rochester, New York. [iii] And again in 1911, a number of Brunery’s paintings were included in an auction at the American Art Association. [iv] His work seems to have been a popular success in the United States, including not only the Cardinal Paintings, but the landscapes and cavalier genre paintings as well. There is little information on the last decades of Brunery’s life, in part because of the disruption of World War I throughout Europe. Despite the lack of a definitive chronology for his art work, Brunery seems to have continued painting until shortly before his death in 1926. [i] Salon de 1879, Catalogue illustre,contenant cent douze fac-similes d’apres les dessins originaux des artistes, Publie sous la direction de F-G. Dumas. Paris:L. Baschet Libraire, 1879. Number 450 Bruneri (F.), Le retard du fiancé. 25. [ii] Illustrated Catalogue of the Paris Salon containing nearly four hundred reproductions in fac-similae, after the original drawings of the artists. Published under the direction of F.-G. Dumas. London: British and Foreign Artists’ Association, 1880. Number 537 Bruneri (F.). Portrait de Mme A. L.10. [iii] Trenor, James Delafield. A descriptive catalogue of the Powers’ Art Gallery, Rochester, NY. Rochester, NY: E. R. Andrews, Printer and Bookbinder, 1891.